The Peggy Guggenheim Collection and the Punta della Dogana François Pinault Foundation are behind the corner. It is found along the well-known Zattere waterfront, possibly the best spot of the city for a stroll in the sun and an exceptional view on Saint Mark's Basin. The public transportation, the Spirito Santo Vaporetto stop line n.6, that is literally next to the apartment, takes only 15 minutes (2 stops) to reach the Lido, allowing the guests to easily access the beach. Laid out on about 120 square meters, it is composed of a total of 4 bedrooms and 3 fully equipped bathrooms. It is elegant and well furnished, suitable for either families with children, or groups in search of a real Venice experience, or elder guests with limited mobility who are after a home just out of grasp of the madding crowds. It features wooden beamed ceilings, stucco Veneziano walls and terrazzo Veneziano flooring. The great plus is the wide open canal view on the Giudecca Canal and the Redentore Church enjoyable from the living and dining room, it captures a lot of sunshine and precious local atmosphere. The apartment is equipped with every possible electric appliance, brand new and functional, such as washer, dryer, dishwasher, oven, large fridge and freezer, kettle, large flat screen TV with DVD player, Wi-Fi internet connection, etc. We wholeheartedly recommend Palladio to admirers of Venetian authenticity desirous of a beautifully restored apartment on the edge of a shimmering canal. Renting the Palladio apartment you can access the garden shared with the twin apartment called Palladio Garden. This was a lovely apartment with great views. Truly Venice were brilliant with communication and very helpful with any enquiries we had. I will certainly use them again. We liked our stay very much. The house is comfortable and nice, with 4 bedrooms and 3 bathrooms, and it accomodates 9 people. The view from the main bedroom, from the living room and from the dining room is amazingly beautiful (other two bedrooms look onto a a garden). The kitchen has all kinds of utensils. It is close to vaporetto stations and to the Guggenheim! Everything about the home was wonderful and good size. It's right on the water so whether you're looking out the dining room or the living room, you're looking over the water. Home is well furnished and has a good flow. The location is second to none! Easy to walk anywhere and in fact so many good restaurants are nearby, you don't have to go far. In addition, you don't have the huge crowds you see in San Marco Sq, yet it's only a 10 minute walk. We had a party of 8 and was a fantastic value! We were looking for a special place to stay where our whole family, aged 5-63, 10 of us, would be happy. to celebrate our 40 years together. Venice seemed like a good option, and the truly venice apartment choice was inspiring. Palladio Premium and garden apartments were excellent. They were spacious, well equipped, clean, and we had a lovely garden. The location was excellent for the water bus, and we soon got to know our way around.We were lucky with the weather and had the windows open to the canal and lots of people stopped to talk, and it was great to watch the world go by. The shop was near enough, we got the bus back sometimes, and some lovely restaurants. Good places were St Margheritta Campo, the vegetable barge and the pasta shop just near academia bridge.The art was superb, and Mask making is fantastic. Dont let anyone say children will be bored, we had children, 5,9, 11 and 13, and they were happy to explore the streets and bridges, the alleys, and fascinated by the boats, the fact that everything was on water, police, ambulance, buses. Enormous cruise liners passed us a few times and they were amazed. They loved the water buses, the bus stops on pontoons that sometimes threw us around a bit, the ice cream, and the fact it us so different. Truly Venice organised things like clockwork, and we had absolutely no problems. It was all great. 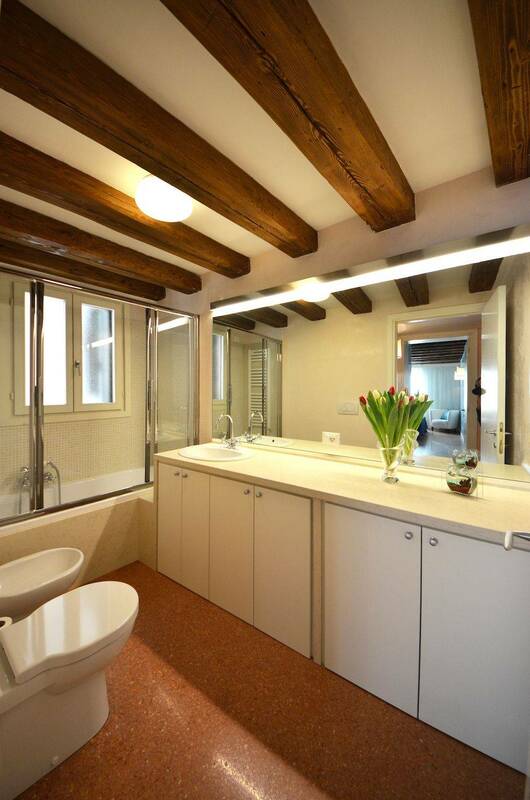 We rented this apartment and the joining apartment from Truly Venice. We were in Venice for a family wedding and the age ranges in our party were 3ys to 75yrs, and the apartment suited us all. The added bonus was the shared enclosed garden so we could sit outside all together and the 3yr old had a great safe space to run. One of our party also uses a wheelchair. 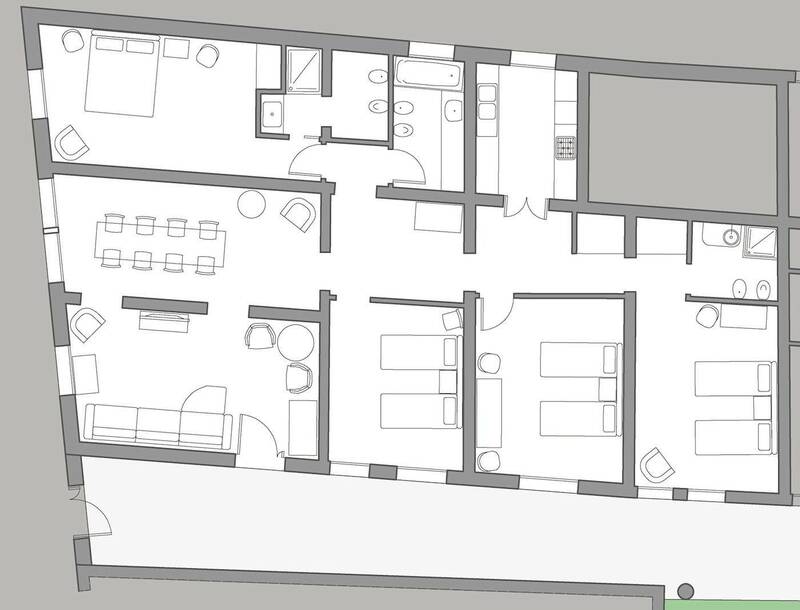 There are a couple of small steps up from street level and the wheelchair needed collapsing to get through the outer door but once in all areas of both apartments could be accessed in the wheelchair. All the linen was very clean and there were plenty of towels provided. There is air conditioning in the apartments but it's not great and 2 extra fans were supplied. There is plenty of crockery and kitchen equipment. The apartment is in the Dorosodouro area of Venice but it is a beautiful part of the art district with lots of places to explore. Along the waterfront from the apartment are restaurants and cafes that serve some lovely food from snacks to full meals. The downside to the location is that the supermarket is quite a walk away but a straight walk along the waterfront so easy to find. The Spirto Santo water bus stop is right outside the apartment and is one stop away from San Marco. We changed at San Marco and went on to Burano and the surrounding islands. The team at Truely Venice are really helpful and met us straight from our water taxi. The view from the lounge window is just magical and we have all commented how much we miss it already. I would recommend this apartment and would probably stay there again if we get chance to return to this wonderful city. 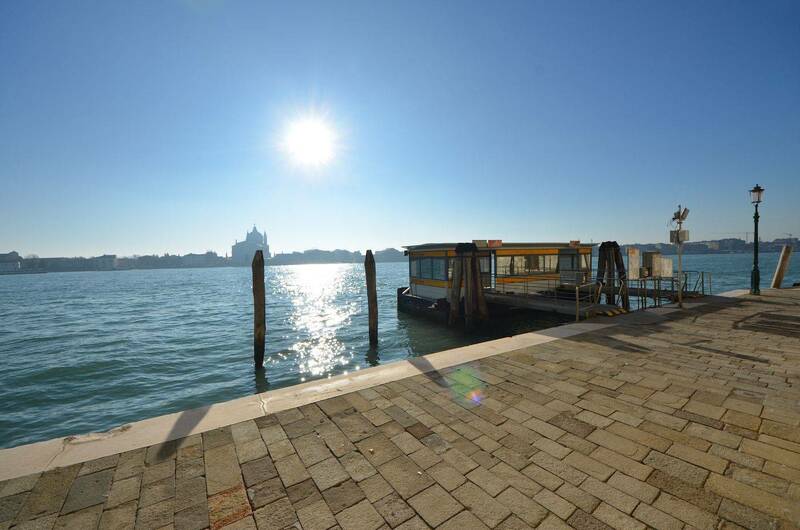 Location excellent with easy access to bars, restaurants and vaporetto stops. Great for our party (which included someone with walking difficulties) as it is on the ground floor and no steps once you are inside the building. Surprisingly quiet considering it overlooks a canal. It also has access to a garden - which was great when we wanted to take photos of the group all dressed up for carnival. Planning a three generation trip to Venice was always going to be a challenge. After all, how do you satisfy the demands of both teenagers and their grandparents? If you are the ones stuck in the middle, then you really have to work hard to try to please both parties in order to have a successful holiday. Fortunately, we had excellent advice and help from Daniela at Truly Venice. We had very specific requirements for a holiday rental apartment, and she came up with the perfect home away from home in the Palladio apartment in Dorsoduro. Would you like wi-fi for the teenagers? No staircases for the grandparents? A vaporetto stop just outside your apartment? What about three of the most popular art museums in Venice at your doorstep? Would you like a room with a view? How about two rooms with a view? We had all these, and more. The folder that Truly Venice provided contained so much information on where to eat, where to shop and what to see that after the first day we left our own guidebooks behind and used theirs instead. After all, this was like having a local friend recommend to you their favourite places. The service which Truly Venice provides extends to organising the pick up by private water taxi from the airport. This made for a very smooth start to our holiday. On our final day, we really appreciated their kindness in allowing us to leave our bags at the apartment until we were ready to leave for the airport. In writing this review, I am mindful of the comments made by other members of my family. They have warned that if I say how wonderful it is, then we run the risk that we will not be able to rent the Palladio in future, due to overwhelming popularity. That may well be the case, but it really is only fair that other families or groups of friends have the opportunity of staying in and enjoying this truly wonderful apartment.